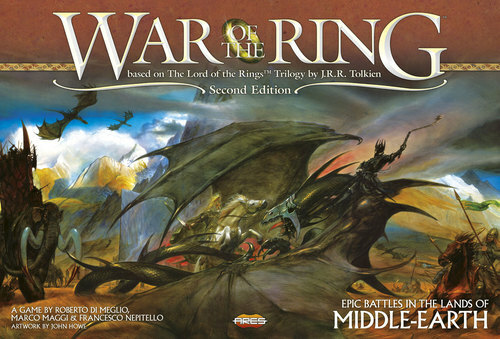 War of the Ring first came out in 2004, designed by Roberto di Meglio, Marco Maggi, and Francesco Nepitello. It was originally published by Italian publishers Nexus, and by Fantasy Flight in the US. However, after producing a Collector’s Edition and taking over the English rights from Fantasy Flight, Nexus vanished. Ares Games picked up the license and published a second edition of the game in 2011. It’s a 2 player game (with a 4 player variant) that takes three hours to play, and is set in the world of Middle Earth, as created by JRR Tolkien. It pits the Free Peoples against the forces of Sauron as the Ringbearer makes his way to Mount Doom. War of the Ring is a huge game, and has a lot of fans – it is currently #17 on BGG. It won the poll with 29.1% of the vote, beating second place Wits & Wagers with 18.6%. 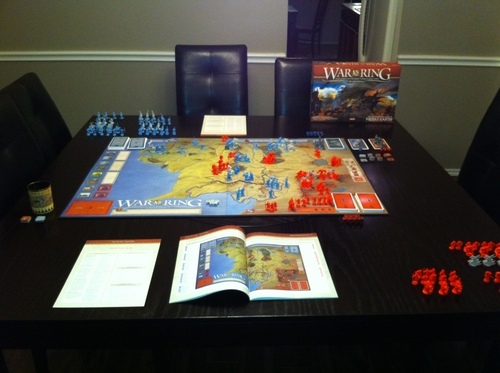 War of the Ring comes with a two part game board; 21 dice (for Free Peoples, Shadows, and Combat); 14 character cards (Free Peoples, Golum, and Shadow characters); 96 event cards (4 decks of 24); 205 plastic figures; and 76 various cardboard markers. At the beginning of the game, the Ringbearers are in Rivendell, and their progress token at 0 of the Fellowship track. The Shadow player gets seven red dice and the Free Peoples player gets four blue dice. Figures are placed on the board according to a preset map scenario. Other counters and cards are set up based on various criteria I’m not going into right now. The game is played over a series of turns, and each turn is divided into six phases: recover action dice/draw event cards, fellowship phase, hunt allocation, action roll, action resolution, and victory check. RECOVER ACTION DICE AND DRAW EVENT CARDS: You get back any action dice you used in the previous turn, plus any dice added to the pool, and minus any dice removed. Each player then draws two cards, one from each of their event decks. FELLOWSHIP PHASE: The Free Peoples may declare the position of the Fellowship. The Fellowship is usually hidden, and if the declare, they move to a region a number of spaces away from their current position equal to the number on the Fellowship track. This activates a city or stronghold they may be in, and heals the Ringbearers. The Free Peoples may also change their guide (initially Gandalf). HUNT ALLOCATION: The Shadow player may place a number of dice in the Hunt Box (at least one if the Free Peoples retrieved one from there in the first phase, and no more than the number of companions remaining in the Fellowship). ACTION ROLL: Each player rolls their dice (not dice in the Hunt Box). If the Shadow player rolls anything with an eye, it goes in the Hunt Box. Character: You have several options here. You could move an army with a leader to an adjacent region, or attack an enemy army in a region adjacent to an army with a leader. You could play a character event card from your hand. The Shadow could move minions anywhere on the map (except into a region with a Free Peoples controlled stronghold) and move the mouth of Sauron three regions. The Free Peoples could advance the Fellowship counter one space, then resolve the hunt for the ring with a roll of the dice in the Hunt box. The Free Peoples could also choose to hide a revealed Fellowship, separate companions from the Fellowship, or move companions. Army: You could move up to two different armies to adjacent regions, or attack an adjacent enemy army, or play an army event card from your hand. Muster: You could move the political track of one friendly nation one step forward, or play a Muster event card from your hand. If you are at war, you can choose to recruit reinforcements. The Shadow can choose to bring one character into play. Event: You can draw an event card or play an event card (regardless of type). Muster/Army: You can choose any of the actions from army OR muster. Eye of Sauron: This is only on the Shadow dice, and these are put immediately into the Hunt Box. Will of the West: This is only on the Free Peoples dice, and can be changed to any other result. You can also use it to bring Gandalf the White or Aragorn into play. VICTORY CHECK: Check to see if either payer achieved a Military victory (if the Shadows control 10 points or more of Free Peoples settlements, or if the Free Peoples control 4 points or more of Shadow settlements). If not, keep playing. The game can also end before this phase if the Ringbearers gain 12+ corruption, or if the Ringbearers manage to make it to the Mordor track from the Crack of Doom. That’s a very brief overview, and doesn’t go into as much detail as there is. The game is very rich in its thematic elements. I’ve never played it, but it seems to be one of the more complex games based in the world of Middle Earth. The dice based aspect that determines what actions you can take is pretty interesting, and I’m sure the cards add some more depth of strategy. One of the main reasons I’ve never played (or tried) is the sheer size of the game – it’s a little intimidating. However, I’d be glad to give it a try in the right circumstances. Wits & Wagers (2005, Dominic Crapuchettes, 18.6%): A trivia game where you don’t actually have to know any trivia. Great fun. Other (10.9%): Nominees include Wabash Cannonball, Wacht am Rhein, War in Europe, War in the Pacific, Warhammer Quest, Warmachine, WarpWar, Warriors of God, Wasabi, Waterloo: Napoleon’s Last Battle, Wayfinder, We Didn’t Playtest This At All, Wellington’s Victory: Battle of Waterloo, What’s My Word?, Winner’s Circle, Witch of Salem, Witch’s Brew, Wiz-War, Wok Star, Word Blur, World at War, The World Cup Game, World in Flames, World of Warcraft: The Board Game, and World of Warcraft TCG. Of those, I’ve played Wasabie (meh), What’s My Word? (iOS, pretty good), Witch’s Brew (great role selection game), and Wok Star (awesome co-op…can’t wait for the Z-Man version). Wallenstein (2002, Dirk Henn, 8.4%): A well-respected Eurogame about trying to gain control of Europe. It makes use of a cube tower – drop some in and see what comes out. It was later remade as Shogun. Web of Power (2000, Michael Schacht, 6.7%): An area influence game set in Europe that was later remade as China. I like Michael Schacht’s games, I might like this one. Washington’s War (2010, Mark Herman, 6.6%): A card-driven wargame set in the American Revolution. People seem to like it. Warhammer: Invasion (2009, Eric M. Lang, 5.8%): A two-player card game set in the Warhammer universe. I know nothing about it. The Werewolves of Miller’s Hollow (2001, Dimitry Davidoff-Philippe des Pallières-Hervé Marly, 5.3%): Like Ultimate Werewolf, this is a packaged version of the Werewolf party game. It doesn’t include as many special characters, but has some unique art. World Without End (2009, Michael Rieneck-Stefan Stadler, 4.1%): Ken Follett’s book The Pillars of the Earth had a sequel called World Without End. Makes sense that the game based on the book would also have a sequel. I haven’t played it, though I would sometime. I wasn’t as big a fan of the book as the original, so I don’t know about the game. Wilderness War (2001, Volko Ruhnke, 2.3%): A card-driven wargame set in the Seven Years War of North America. We the People (1994, Mark Herman, 2%): This was an earlier version of Washington’s War. It didn’t raise the stink that Imperial/Imperial 2030 did (probably because, even combined, it wouldn’t have won), but it’s another instance of my ignorance showing. That does it for W. See you next time for X. Thanks for reading!